NCA, along with our nationwide network of Children’s Advocacy Centers, State Chapters, and partners, have spent the last 10 years creating and executing a strategy to achieve one goal: to help kids thrive. Evidence-based, trauma-focused mental health treatments help kids recover from the trauma of abuse and go on to thrive. In 2009, National Children’s Alliance (NCA) recognized the need to develop the capacity of the entire Children’s Advocacy Center (CAC) movement to deliver these science-backed services to kids across the nation. As the primary response to child abuse in the United States, CACs are well-positioned to deliver healing to kids nationwide, and currently provide some 200,000 children each year with mental health services. Here are some highlights of our accomplishments over the past 10 years, achieved in partnership with CACs, State Chapters, Regional CACs, and national stakeholders. 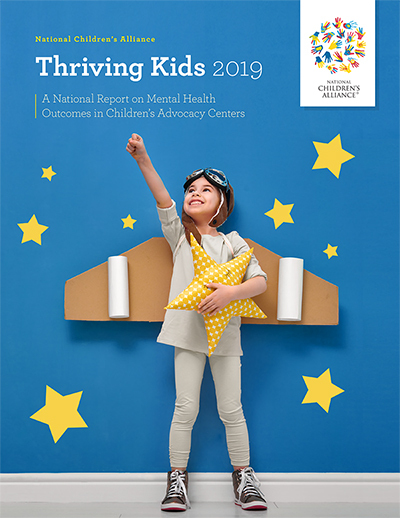 See Thriving Kids 2019, our all-new national report on mental health outcomes in Children’s Advocacy Centers, and learn how we got here and where we’re headed next. Through the hard work of CAC leaders in partnership with NCA, not only has the system change been transformative for the mental health services offered in CACs, but more importantly, it has been transformative for children and their healing. Kids at CACs usually need evidence-based treatments. And, to plan the right treatment and make sure it’s working for children and their caregivers, CACs need to use evidence-based assessments (EBAs). Since 2015, NCA has provided EBA training to 112 clinicians from CACs in 10 states and expanded services to many more. Through these projects, clinicians administered assessments to nearly 1,000 children and their caregivers—a number that will continue to increase as those clinicians see more clients every year. Child abuse and other forms of trauma can have lifelong effects on children, families, and communities. Yet the evidence-based treatments CACs provide have been designed and tested for treatment of child trauma-related symptoms. It’s through the use of those proven techniques that CACs are making a difference in kids’ lives—and helping their caregivers, too. 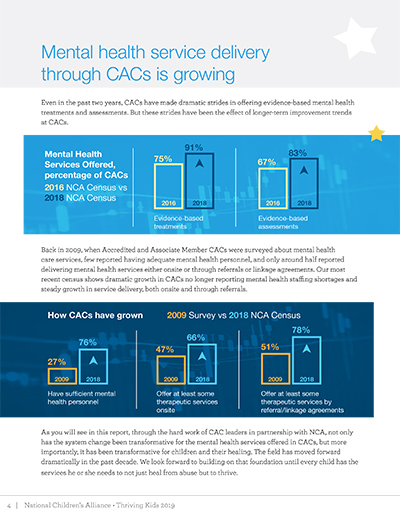 NCA provided millions of dollars in mental health implementation grants to CACs over a 10-year period to improve their practice. 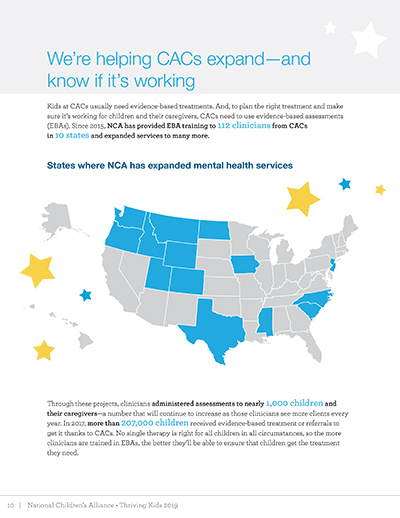 NCA members provided mental health services or referrals to more than a million children over 10 years. NCA trained 112 clinicians in 10 states in evidence-based assessments to ensure that treatment is targeted to children’s trauma symptoms. Through these projects, clinicians have assessed nearly 1,000 children and their caregivers so far. 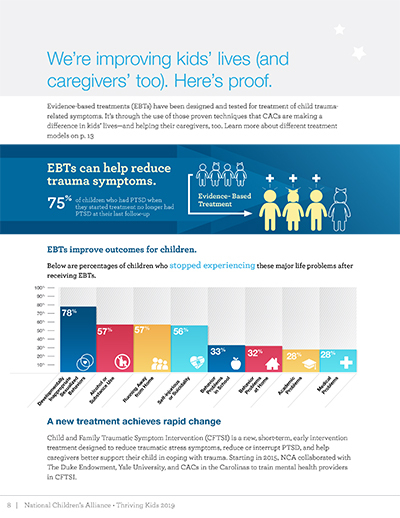 NCA trained 72 clinicians across four states in Child and Family Traumatic Stress Intervention (CFTSI) as a way of expanding the range of evidence-based interventions available in CACs, and providing a short-course therapy to victims whose trauma happened recently, reducing wait times for treatment. So far, 899 children have benefited from this pilot program. Read the report now and learn your part in this important work.